Delhi, Agra and Jaipur form three corners of the aptly named Golden Triangle, but this tour takes it up several notches. The intrigue and anticipation of a jungle safari at Ranthambore and the oasis of royalty at Samode and Neemrana comprise this sojourn’s highlights. Delhi is the fitting start to the tour, with its harmonious blend of the classic and the contemporary. For history buffs, Delhi has marvellous monuments such as the Qutub Minar, Red Fort, Jama Masjid, India Gate and numerous museums. It’s buzzing cafes and restaurants are a foodie’s delight. And for the bargain hunter or victim of fashion, it offers unlimited shopping options. Agra, the next stop, is synonymous with the incomparable Taj Mahal. No picture does justice to the marble marvel and its breathtaking architecture and intricate lattice work. Other Unesco world heritage sites include Fatehpur Sikri and the Agra Fort. Experience splendour and suspense in equal measure at Ranthambore National Park. While everyone is unabashedly after the sighting of the elusive and majestic Royal Bengal Tiger, don’t let that dull the delight of spotting other wildlife such as Indian gaur, sloth bear, deer, peafowl and much more. The ruins of the Ranthambore fort inside the reserve are the ideal setting for any photographer. Rajasthan’s capital city Jaipur, famous for its sandstone buildings, is full of stunning monuments such as the City Palace, the honeycomb Hawa Mahal and, of course, Amber Fort. Jaipur is also known for its traditional handicrafts and unique souvenirs such as camel-leather slippers. Samode is a sleepy little village an hour’s drive from Jaipur. Its local artisans produce printed cloth and glass bangles. 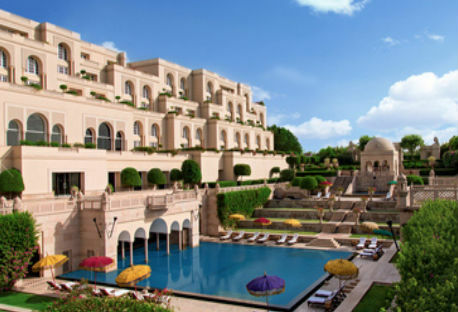 But the piece de resistance is the 475-year-old Samode Palace that has been lovingly maintained to offer its guests old-world opulence combined with the finest hospitality. 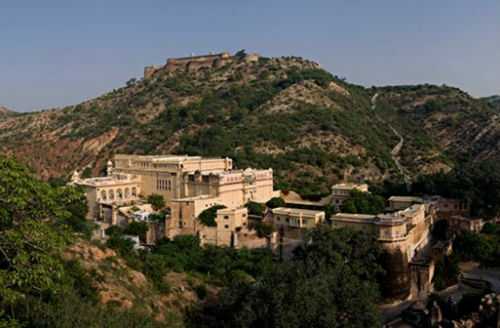 Neemrana Fort-Palace is another heritage property nestled among two mountains. Hanging gardens, swimming pools and a soothing spa make sure that the experience is as luxurious outside as it is within the rooms. AGRA: Known for its stunning architecture, exotic history, and magical views, the Taj Mahal attracts as many as 7 million visitors each year, and for a good reason. It is, after all, the monument of love! This iconic landmark is one of the main reasons why people from all over the world visit Agra, but the city is also brimming with UNESCO World Heritage Sites, Mughal mausoleums, tombs, a beautiful fort and ancient bazaars. You’d expect to feel underwhelmed due to all that hype, but this magical city is everything you expect it to be. 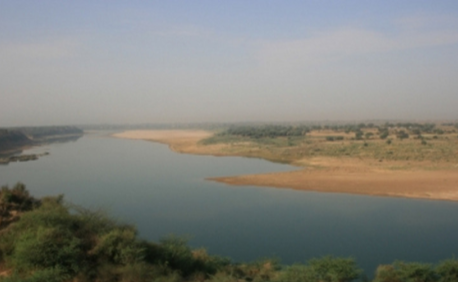 RANTHAMBORE NP: Considered to be one of the best national parks in India to see the Bengal tiger in its natural habitat, and ideally accessed either by train from Delhi or fits in nicely during a Golden Triangle tour between Agra and Jaipur. Ranthambore National Park presents a secluded oasis full of tropical dry deciduous forests and some of the most beautiful creatures you’ll ever see. Other sightings include leopard, jackal, Indian wolf, sloth bear, fox, blue bull antelope, sambar deer, chital, langur, crocodiles and an incredible variety of birds. Safaris are restricted to the mornings and evenings, so you have enough time to explore the surrounding area, visit 10th-century fortresses, discover abandoned settlements or simply enjoy the amenities offered by your luxury resort. Don’t forget to capture vivid images of your experiences, for Ranthambore is also considered to be a photographer’s dream. It presents incredible wildlife sightings, offers luxurious accommodation and also has adequate internal transportation facilities. The Tigers sighted here have found their ways to several books and movies as have the countless ruins and structures surrounding the park. 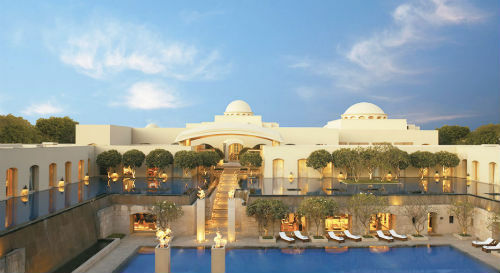 JAIPUR: The Pink City, the largest city of Rajasthan, is an epitome of magnificence and vibrancy. This city was established in 1727 by Jai Singh II and is India’s first planned city. It is known as the Pink City because of the colour of the stone used exclusively in the walled city. The Pink City stands out as one of the most spectacular and vibrant destinations on the planet, its rich lineage, striking culture and beautiful architecture painting a vivid picture of Indian society. Missing out on The City Palace, Hawa Mahal, Jantar Mantar, Jaigarh or the Amber Fort is a big no-no, but make sure you reserve time for those chaotic bazaars and delicious cuisines. Jaipur is also known for its traditional handicrafts and unique souvenirs such as camel-leather slippers. The John Madden 2012 hit The Best Exotic Marigold Hotel (You can link this to your Best Marigold tour) stole our heart presenting India in an entirely new light, one that suddenly catapulted some of its more exotic destinations like Udaipur and Jaipur to instant stardom. SAMODE: Discover the cobbled lanes and ancient alleyways of Samode village, with hidden frescoes and beautifully created windows, stroll past golden mustard and cauliflower fields, explore a time-trapped village. Explore the local market, stopping by the little shops where you will see the bangle maker, the cloth merchant, the gemstone expert. A mesmerising town that is best known for its stunning Samode Palace, a fairytale that boasts mural-lined walls, mirrored hallways and countless antiques and treasures. Other places worth exploring in Samode are the 16th century Mughal garden at Samode Bagh. The historic pink city of Jaipur is just an hour’s drive away. NEEMRANA: Neemrana is a beautiful heritage hotel, emerging out of the blue as a towering symbol of vitality in the heart of bareness. A great fortress, bathed in the jewel-encrusted rays of the Rajasthani sun, stands tall between two emerald green mountains, echoing the richness of Rajput tradition. An option to swap yesterday’s sunset visit to the Taj Mahal and instead take an early morning sunrise visit. Then after an early breakfast drive to Fatehpur Sikri for sightseeing. 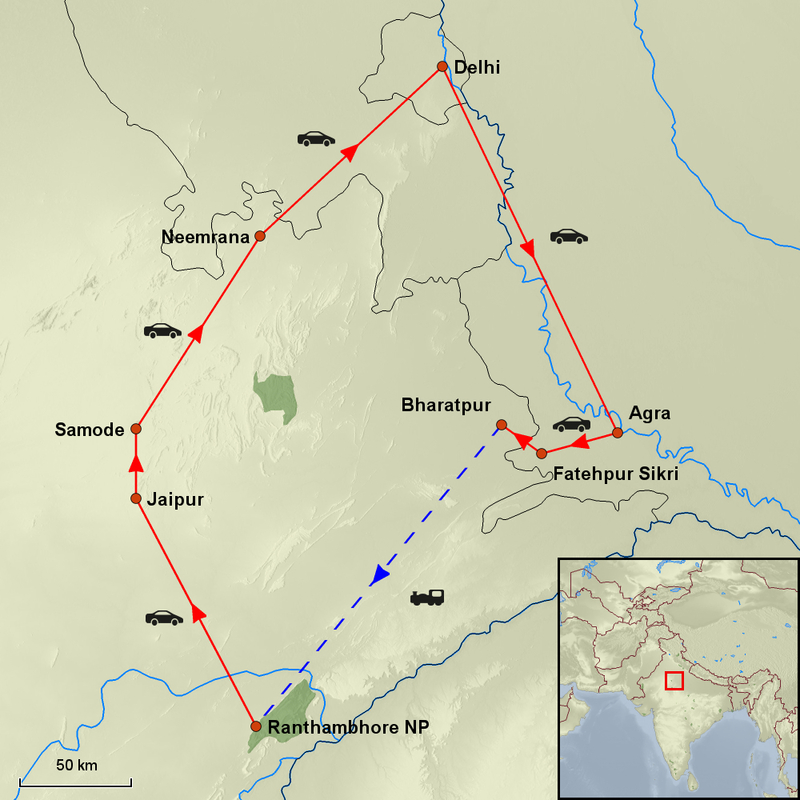 Drive to Bharatpur station for the train to Swai Madhopur the gateway to Ranthambore National Park. On arrival transfer to your hotel then at leisure. Early morning you will take your first game drive into the park, then return to the hotel for breakfast, after that the rest of the day is at leisure until your afternoon game drive. 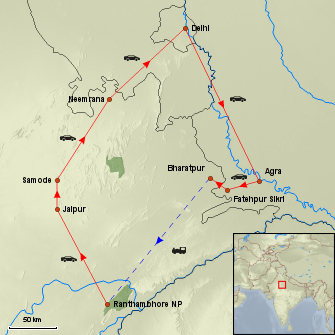 Today as yesterday you have two game drives in Ranthambore NP. Between your safaris today you can visit the Village Women’s Craft where you can see a variety of handmade carpets, woolen carpets, tribal rugs, wildlife paintings, shawls, bed covers and much much more. After breakfast, you will drive to Jaipur (3.5 hrs). On arrival after check in you will depart on a private guided tour of the city. Morning at leisure then later you will drive to the village of Samode (1 hr). On arrival, the rest of the day is at leisure after a guided tour of the Palace. Relax by the pool or walk out and explore the village. After breakfast drive to the village of Neemrana (2.5 hrs). On arrival at leisure. Leisure day to relax or explore the local village. Don’t forget to take some time out to explore the seven palace wings which are built over 14 layered tiers into the hill across 6 acres of gardens. Morning at leisure then around midday drive to Delhi airport (2.5 hrs) on arrival check into your airport hotel, then at leisure. 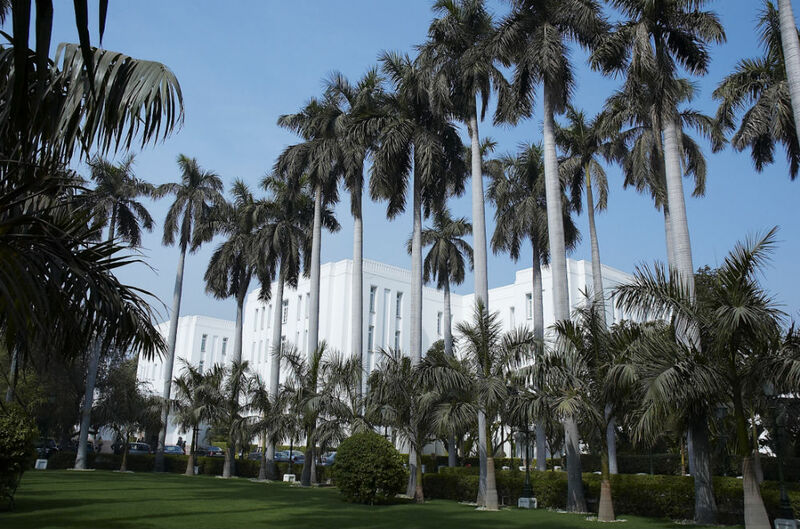 The Imperial Hotel New Delhi is a legend that offers a unique experience embracing facets of India’s history, and stands witness to the birth of the capital city of New Delhi. 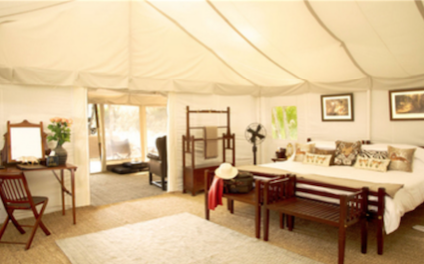 Sher Bagh is an ultimate luxury safari camp resort consisting of 12 luxurious tents located on the borders of the world–renowned Ranthambhore National Park. Inspired by the Safari encampments of the 1920s, preferred by Princes and Grand Seigneurs of the time, each tent is furnished with 19th-century ‘Campaign Style’ furniture and has all the comforts you could wish for on safari. 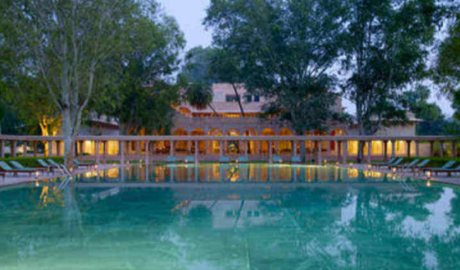 Samode Haveli was built 175 years ago it was then the residence of the rulers of Samode at that time and is still occupied by their descendants today, who have converted their home into a luxury hotel. The Haveli is a traditional Indian mansion set in a verdant garden with apartments arranged around a series of intimate courtyards. The former royal apartments are now deluxe suites and rooms where each room has its own character but now with modern amenities. Then we have the new courtyard rooms which look out on the lovely pool, fountain courts and gardens of the old Havel. This 475-year-old Palace can be found in the small village of Samode located just an hours drive from the capital city of Jaipur. It has played host to celebrities, and royalty and you to can join this list of discerning travelers. In the evening sip cocktails on the terrace garden with folk music to accompany you. 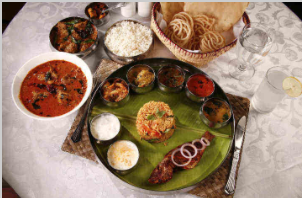 Dine at one of two restaurants that offer a choice of Royal Indian delicacies or Asian and European fare. Wake up to the quiet dawn with just the sound of birds and peacocks. Take a walk in the village during the day or take a gentle healing massage at the spa. Samode Palace weaves its magic on you and leaves lasting memories. 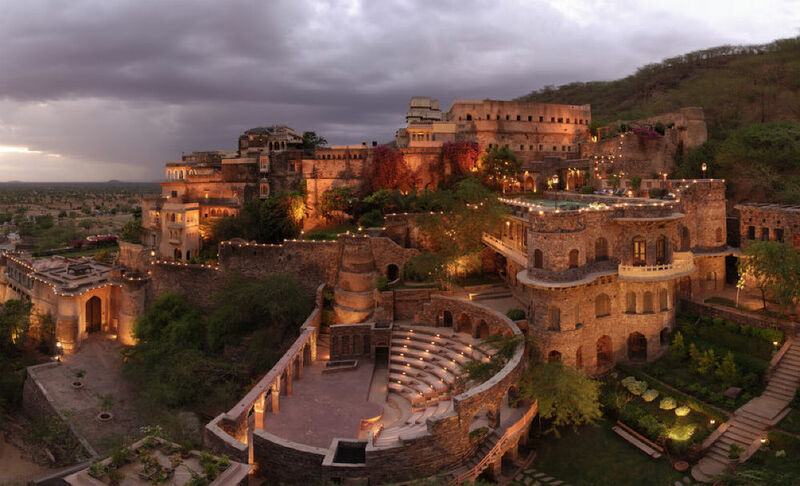 Built in 1464 AD, Neemrana Fort-Palace is among India’s oldest heritage resorts. 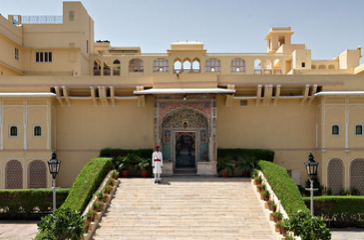 It is Rajasthan’s closest palace from New Delhi, located just three hours away on the Delhi-Jaipur highway. Sitting on a majestic plateau, concealed in a horseshoe formation of the billion-year-old Aravalli ranges. From 1986, the old ruins of this Fort-Palace have been sensitively restored and reconstructed. The rooms are furnished with an eclectic mix of traditional Indian and colonial furniture, antiques and objets d’art. Most rooms have private balconies or terraces. Add an extra day in at Jaipur and learn to cook Indian food with a local family Contrary to popular belief, Indian food is not just about curry and chilies; it’s diverse, delicious and not as difficult to cook as you might think.